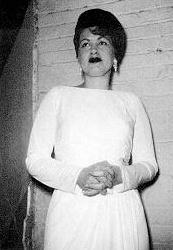 This picture, taken by Mildred Keith, was snapped backstage at the Memorial Hall in Kansas City, just moments before Patsy got on stage for the last time in her life, on Sunday, March 3, 1963. Mildred Keith also snapped a photo of Hawkshaw Hawkins on stage earlier that evening (see the Hawkshaw Hawkins picture page for that photo). She walked onstage clutching a tissue in her hand, and launched into her hit songs, including "Leavin' on your Mind." She held her finger to her right ear when she reached for the high notes, apologizing to the audience for not being at the top of her form (she was suffering from fatigue and the flu). Dottie West, who was there, and shared a dressing room with Patsy said later, that Patsy was genuinely moved by the standing ovation and told the crowd, "I love you all." 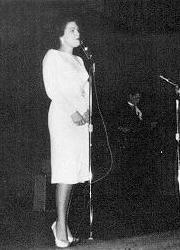 The photo at the right is believed to be the last photo ever taken of Patsy Cline in concert. Despite fatigue and flu, she put on a magnificent performance, singing among others, "She's Got You," "Heartaches," "Am I a Fool," "Faded Love," and "Sweet Dreams," (the latter two which she had just recorded a month earlier and had not yet been released on record). She was the final act for the show and got a standing ovation, looking radiant in the white dress and classic high heel pumps.